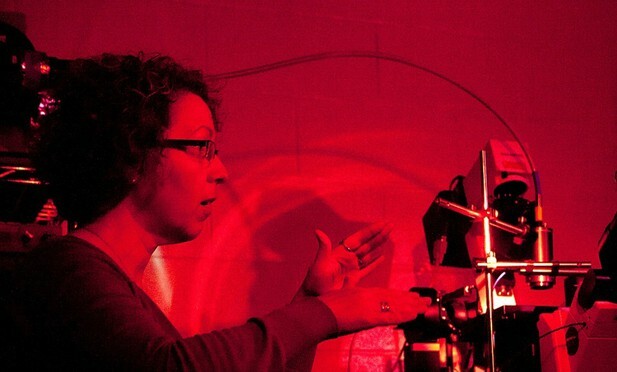 Elena Oancea is a tenure-track assistant professor with her own group at Brown University, where she explores the biology of skin pigmentation and the skin’s responses to light. When she is not a scientist, she is a mother but, as her children tell her, more often than not she is both. Elena Oancea at the microscope. Image credit: Mike Cohea, Brown University. What attracted you to studying the biology of pigmentation? I became intrigued by pigmentation when, as a postdoc, I worked on an ion channel that is important for the function of melanocytes – the pigment-producing cells of the skin. I was surprised to find out, when reading about these cells, that many questions remain about their physiology and the biology of the skin. So I decided to study melanocytes, human skin and pigmentation when I started my lab at Brown. It depends on how patient my audience is! I try to keep the molecular stuff very simple and to focus more on the bigger picture: how our skin gets its colour and how it detects and responds to solar ultraviolet (UV) radiation. If they are still with me, I then tell them about how interesting melanocytes are. For example, they produce the pigment melanin, and when melanin production goes wrong, it causes albinism, a disorder that affects skin pigmentation and vision and that increases an individual’s susceptibility to skin and eye cancer. The most common form of albinism is caused by mutations in a protein of unknown function that is found in melanosomes – the small, membrane-bound vesicles inside our skin cells where melanocytes make melanin. We discovered the functions of this protein (Bellono et al., 2013). It appears to allow negative ions to pass from the inside of a cell into the melanosome itself, possibly by forming a channel in the membrane that encases the melanosome. We think that it does this to change the proton concentration inside the melanosome which, in turn, increases the activity of the main enzyme that produces melanin. Discovering how this protein functions in melanosomes, and how it might regulate their melanin content, allows us to start thinking of new drug targets and potential therapies for albinism. We’ve also potentially discovered a new kind of ion channel protein here, or perhaps a new protein that functions together with an ion channel. We are continuing to investigate how ion channels and the movement of ions across the membrane of melanosomes influence their properties and their ability to produce and store melanin. We are also interested in other light receptors present in human skin and how they shape our skin’s response to light. There have been a few exciting moments in my lab. One of them was when we discovered the response of melanocytes to UVA light, the dominant form of UV found in solar radiation. More recently, it has been a remarkable technical achievement by a very talented student, Nick Bellono, which gave us our first glimpse into the inner life of a melanosome. Away from the bench, getting the reviewers’ comments on my first R01 NIH grant application was among the worst moments of my scientific life – that really shook my confidence in the funding system and my belief in my ability to evaluate data and determine new directions for my research. Both my PhD and postdoc mentors, Tobias Meyer and David Clapham, influenced my career and my general approach to science. I learned a tremendous amount from both of them. I still discover myself at times thinking of discussions I had with them and their take on particular issues. I also often find myself telling my own students about the lessons I learned from them. I think the funding system for basic research is not working very well – fixing that would definitely improve how science is done and what projects we choose to pursue. For example, the way grant applications are reviewed and evaluated does not particularly encourage creative and novel research, or new approaches, especially if they involve basic science. Having separate NIH funding mechanisms for young investigators would improve our professional lives and make the grant review process less stressful and fairer. Is your significant other a scientist? My husband is an engineer; we both went to Graduate School at Duke University. His support and help at home and with the kids is crucial for keeping my work-life balance in equilibrium. I have many interests: pottery, cooking, photography. But those hobbies are mostly on hold for now while my daughters grow up. My main interest outside science is spending time with them, doing whatever they are passionate about. We did pottery classes together last year, we are knitting this year, and I am looking forward to the next big thing. Yes, at times, especially because the work I do does not end the moment I leave the lab, just as being a mother does not stop when I enter the lab. I also have a lot of guilt about not doing enough as a mother. However, the mothers of older children tell me that when children grow up, they appreciate having had a working mother. I hope this is right. I would like to be in my lab, surrounded by smart, enthusiastic and creative people, and working on new and interesting cutting-edge projects, learning new techniques and tackling new problems. Some colleagues might be surprised to learn that I grew up and went to college in Romania. I also taught high school physics for a year, before deciding that it was not for me and that I had my heart set on research. In retrospect, it was an invaluable experience. What’s the best joke currently being told in your lab? I don’t know, which makes me think that maybe I ought to spend more time in the lab and less time in my office in front of my computer! What question should we ask our next interviewee that we didn’t ask you? What are we never prepared for as postdocs that we have to be very good at as soon as we start our own labs?